Please see our full listing of products. Please note that we will highlight if a particular department or fund will be the beneficiary from the sale. If no department, ward etc., is indicated then the funds will go towards St. James’s Hospital. We are in the process of developing the shop and would love to receive any feedback or comments you may have. 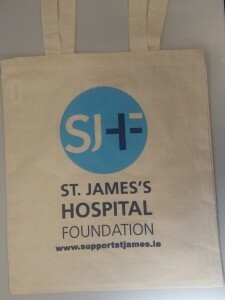 So please send your emails to suzanne@supportstjames.ie. An original Liam Jones painting to be raffled in aid of the Target Lung Cancer appeal. 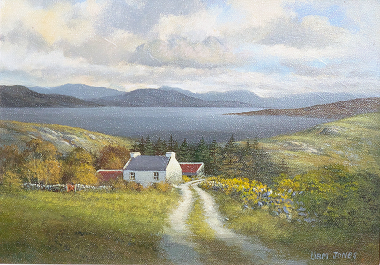 The painting is newly framed and you can purchase tickets, at the cost of €10 each. There is a limit of 500 tickets. The tote bag is made of 100% unbleached cotton which is ethically produced in India. It is approximately 41cms in length and approximately 37cms in width,with handles of approximately 69cms long. This is great bag for shopping as it can just pop into your handbag or pocket for when it’s needed. Each bag cost €5 plus €1.50 postage. The Brave pins are approximately 2.5cm (around an inch) in diameter. 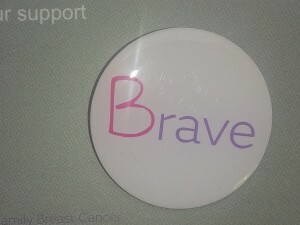 They have an enamel front with the word ‘Brave’ on it and a metal butterfly clutch back to secure it to clothing etc.